South Korea's Ex-President Sentenced To 24 Years For Corruption : The Two-Way Former President Park Geun-hye was convicted and sentenced Friday in a corruption scandal. Park, who says she's a victim of "political revenge," has one week to appeal. 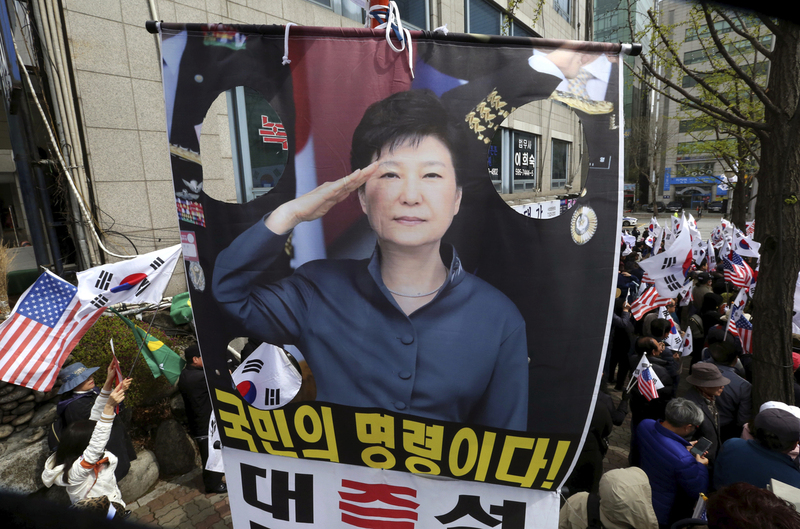 Supporters of former South Korean President Park Geun-hye stage a rally to call for her release near the Seoul Central District Court on Friday. The panel of judges at the Seoul Central District Court found Park guilty of crimes including bribery, abuse of power and leaking state secrets. Park has maintained her innocence, saying she's a victim of "political revenge." Her lawyers plan to appeal. In a verdict broadcast live and streamed in cabs, offices and cake shops, the court ruled Park did pressure top business executives to donate millions of dollars to slush funds run by her friend and confidant, Choi Soon-sil in return for government favors. Choi was sentenced to 20 years in prison in February. The corruption scandal, which first began unraveling the Park presidency in the fall of 2016, ensnared dozens of government officials and businesses. She's been in prison since the spring of 2017 and did not show up to hear her sentence being read aloud. Park is the daughter of South Korea's former dictator Park Chung-hee and was the nation's only female president. A tragic figure after the separate assassinations of her mother and father in the 1970s, she rose to political prominence helped by nostalgia for her father's rule. But her presidency was controversial from the start, dogged by admissions that the country's spy agency flooded social media channels in the final days of the presidential election to help her to victory. The fall 2016 revelations that her close confidant, Choi, who had no official government position, was editing national policy documents and making behind-the-scenes decisions for the president led to street protests in which hundreds of thousands of Koreans called for Park's resignation. When Park defiantly stayed in office, lawmakers impeached her in December 2016 and a court removed her in March of last year. Park still has supporters, though, and they turned up Friday before the court proceedings began. They carried flags and banners reading: "Immediately release innocent President Park Geun-hye," and "Stop murderous political revenge."